I’d like to share a story from my book Tales From Clear Creek. The story is titled The Horse. Some backstory to the tale below . . . the horse’s name is not mentioned in the story. My Tennessee-born grandfather came to visit us the same day we bought the horse. We gave my grandfather the honor of naming the colt. He promptly said, “Call it Dixie.” The name would have been more suitable for a mare than a colt, but Granddad said to call him Dixie, and we did. The horse soon learned to come to it. Dixie the horse was always trustworthy and gentle. My younger sisters and kids from the community rode him, yet I would get on him and ride breakneck, chasing cattle. 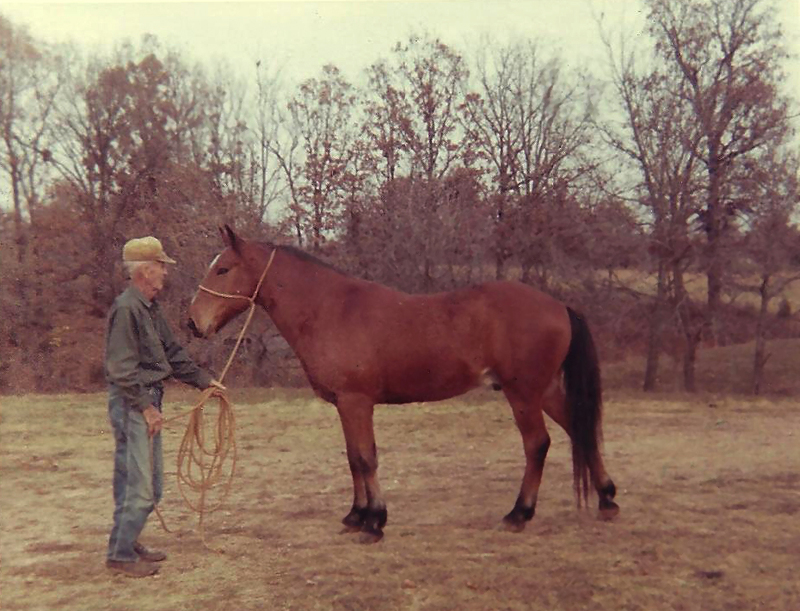 As noted in one of the stories in Tales From Clear Creek, I sold the horse in 1963. Earl Powers contacted me when I came home on leave between basic training and AIT training. He knew the horse was gentle, and wanted him for his grandchildren to ride. Years later, probably about 1968 or ’69, Earl came into my office at the local electric cooperative and showed me pictures of the horse with at least a half dozen kids sitting on him. They were lined up from his withers to his rump. The horse would have been close to twenty years old at the time Mr. Powers gave me that picture. I hope you enjoy the story. If you’d like to purchase a copy of Tales From Clear Creek, click the “Books” tab above. 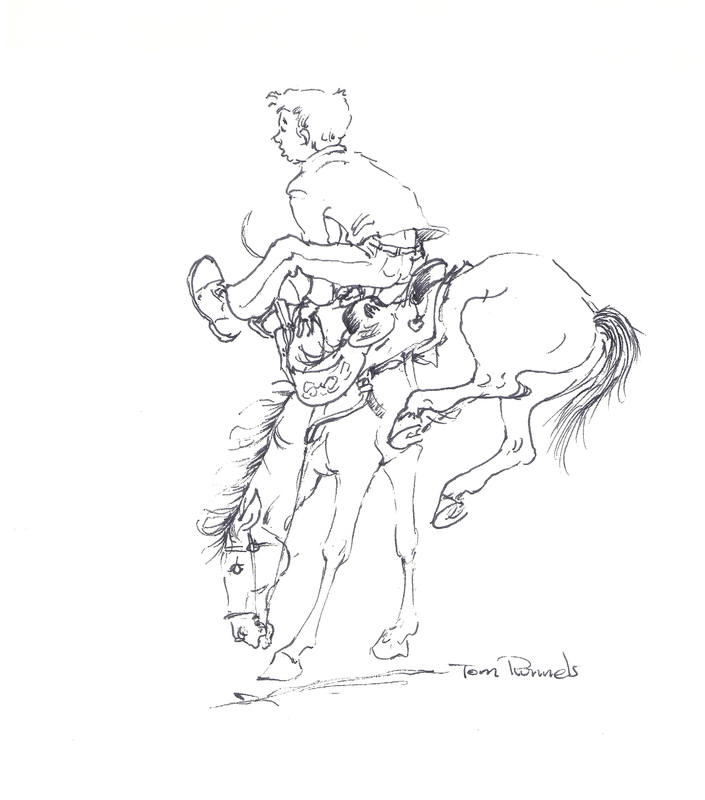 To see all the wonderful illustrations done for the book by Tom Runnels, go to my Facebook Page. Merry Christmas from the Sundown Trail. He was just a weanling colt. We bought him at an auction. I rode home in the pickup truck with him. I wrapped my arms around his neck, and talked to him to reassure him. We had other horses, but this one would be mine to break, to train, and ride. The months went by. He learned to trust me. He let me handle his feet. He grew accustomed to the halter, saddle, and then the bridle. We trekked all over the place. The colt followed me decked out in full riding gear. We were buddies. He thought he was my peer, my equal. He was a pet and that would cause him to be more difficult to break. I knew I must ride him soon before he grew older and stronger. It took a long time for me to work up the nerve to make that first ride. Finally it was time. I led him out into the middle of the hay meadow. I fussed with the tack, tightening the cinch on the old rodeo association regulation tree saddle. Made by the Gallup saddle makers of Pueblo, Colorado, it was a splendid, all-around, old-time, working saddle. I figured that once I was firmly anchored in the deep seat, I could ride him out. I caught my breath, turned the stirrup out, shoved my foot in, and swung on. I hooked the off stirrup and settled in. I had my firm seat. He turned his head to size up what was happening. I clicked my tongue and nudged him with my right foot. He stepped out, got his head down, and started to buck. He made several short bone-jarring jumps. Then he bucked sideways. I lost a stirrup, then regained it. It seemed like an eternity. The border fence loomed up beside us. A barb on the top wire caught my pants leg and ripped a hole. I bailed off, fearing injury to the horse or myself. My knees were weak. I leaned against him, letting him calm down. I let him blow, building up my nerve. I knew I couldn’t stop. I had to finish the job. Finally I led him back out into the meadow. I stroked his shoulder and talked to him, taking the reins up in my left hand. Mounting up, I kept a tight rein, holding his head up this time. He began to run. When he started toward the fence, I turned him by pulling his head around. He ran the full length of the meadow and then back again. He was larger and stronger, but I stayed with him. Out there in the meadow we finally came to terms. I would ride and he would carry. A partnership began that was to last many years. He never bucked again. His training progressed nicely. He learned to work cattle. We drove them from pasture to pasture or to the barn lot. Nothing fancy was needed, our stock was a mixture of dairy and beef. Dad had given me orders to go easy on the dairy stock. I decided to train him with the rope. After all, every good stock horse should know how to work under a rope. I started by dropping loops over fence posts. Then I secured the rope to the saddle horn. I would get off and make him back off to tighten the slack. I would jerk and tug on the rope. He would face me and set back on it like a pro. Several weeks later, we were bringing some yearling heifers up from the pasture. The small herd consisted of some Shorthorn and some Jerseys. One of the Jerseys was a little roguish. She had a perfect picture book set of small horns. In fact, she looked just like the picture that we used to see on the condensed milk can. The cows were filing through the gate when the Jersey decided to make a break for it. The horse wheeled and went after her on his own, but she had a lead on us and was about to get away. In frustration, I flipped the loop after her. Then things started to happen. The loop floated out over her back and settled perfectly over her horns. The horse went into a slide, throwing his weight to his rear legs. He was as solid as an oak tree when the heifer hit the end of the rope. She went airborne, turning a cartwheel through the air and landed on her side with a sickening thud. I jumped off the horse and raced to the heifer thinking I had killed her. I jerked the loop off her horns and she just laid there groaning with her eyes rolled back in her head. I nudged her with the toe of my boot. To my relief she finally scrambled up and trotted towards the gate. I coiled the rope and started to get back on the horse. Looking toward the barn, I saw my Dad standing in the doorway. “Bring it here,” he said. Head down, I shuffled over and reluctantly handed the rope to him. The rope disappeared for several weeks and then one day it suddenly appeared on a nail in the feed alley. I watched it for several days. Finally, I slipped it down and tied it back on the saddle. The horse and I were back in business. I never had anymore trouble from that heifer. She knew I could reach out and touch her!